Visitors to the Mercedes Benz New York Fashion Week were met with frigid cold and winds on their approach to the Lincoln Center venue. 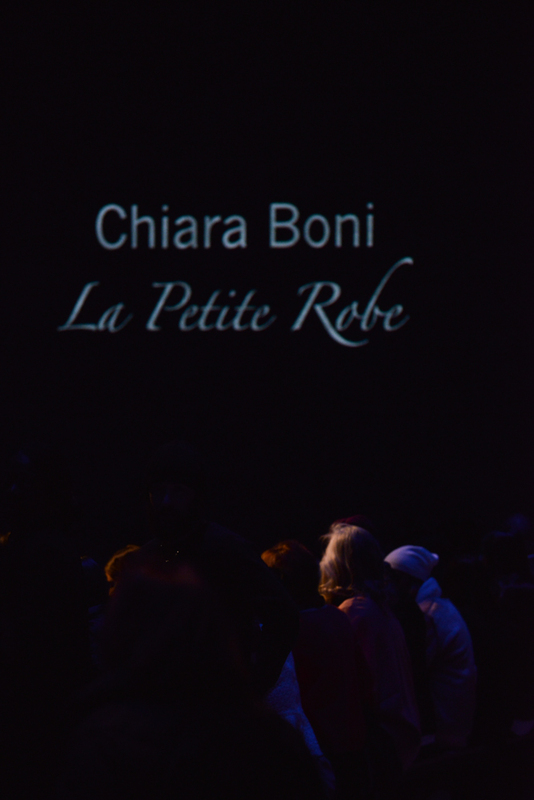 Still dressed in winter hats and coats, the audience gathered for Chiara Boni’s La Petite Robe show and was soon warmed by a parade of romantic styles. The Italian themed soundtrack included Volare and O Sole Mio. The show proceeded before a whimsical backdrop of a pink villa with formal gardens in tones of green and blue. 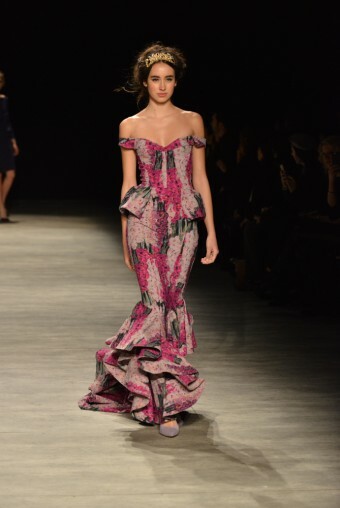 Floral colors and jewel tones were prominent in both solids and prints, and included shades of mauve, rose, lavender, indigo and emerald. 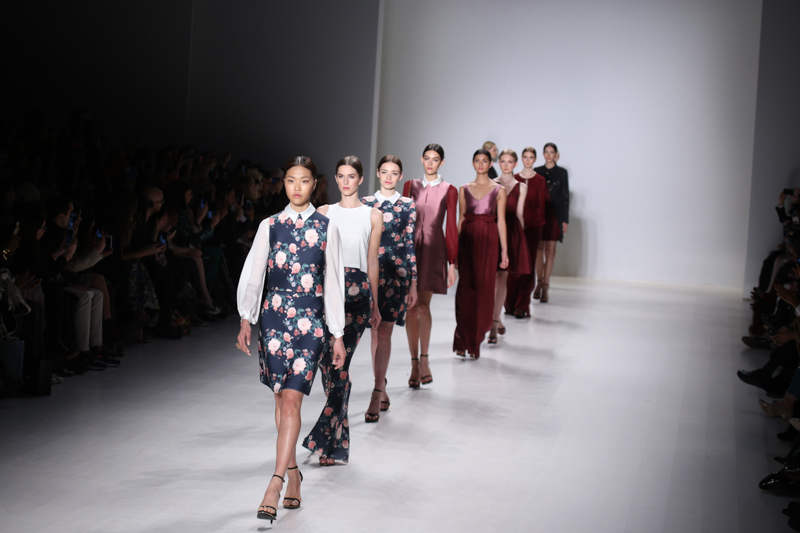 The show opened with a muted rose-colored skirt and a jacket with a turned-up collar and kimono sleeves. 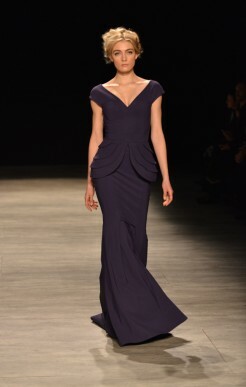 Crossed to the side and secured by a belt, it signaled the asymmetrical styling of many of the dresses that followed. 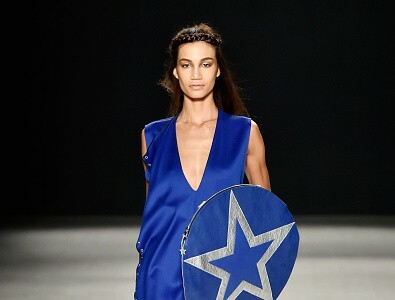 Cut-outs, halter-tops, peplums and mermaid silhouettes appeared alongside softer styles, and fabrics ranged from jersey and eco-leather to tulle and lace. 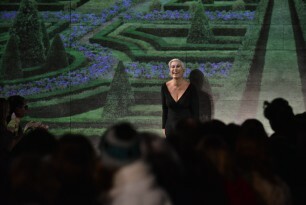 Nature and romance were just a few of the themes on display. 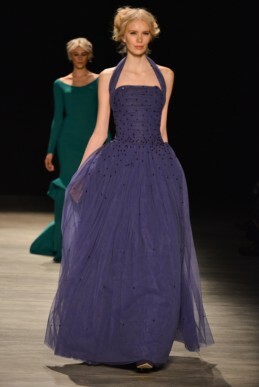 The color-filled opening was soon contrasted by a dramatic variety of short and long black gowns that combined sheer fabric and jersey with bold, golden appliqué in floral or geometric motifs. 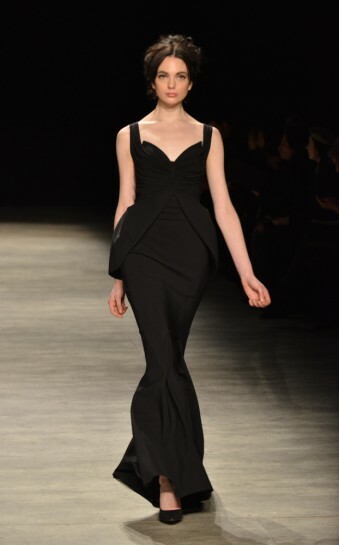 The show ended with a stunning black gown with armour-like gold appliqué, topped by a sheer, wide, trailing black cape. For further information on the La Petite Robe A/W15 collection visit here.